If you have not been aware of this by now, starting May 17th will be the St. Francis Circle track project will start, and they will do some serious work to one of the most craziest intersections in all of San Francisco. What's the best way to describe St. Francis Circle? It's a massive track switch point for the M-Ocean View and the K-Ingleside lines while there's cars zooming around in various directions; it is also infamous for the long signal waiting times, the longest in the city. But more importantly, the project will be going on the entire summer and is expected to be finished sometime in the fall. This means Muni metro service on the M and K lines will be running bus service instead of rail. To review the project, click here. 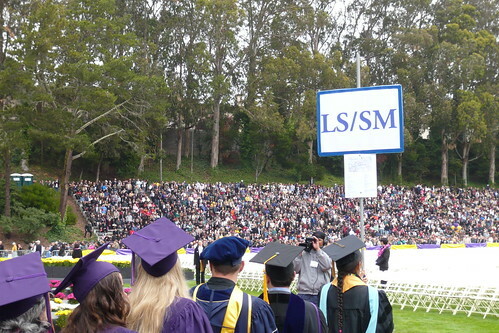 Commencement at SF State will be on Saturday, May 22, and you might be assuming the M line will be running bus shuttles... well, you are half correct. Here's the big news from the campus: The M-Ocean View line will run BOTH bus shuttles and rail service due to Commencement. There will also be additional service on the 28-19th Avenue bus line, which is also the main connector to service at Daly City BART. Tens of thousands of people will converge on SF State for one of the biggest days ever. M-Line Service: M-Line rail service will operate from 8:30 a.m. to 5:30 p.m. between West Portal Station and Balboa Park Station. In addition, the M-Line bus substitution that is already scheduled to operate during the St. Francis Circle rail replacement project will remain in service. Thus, those wishing to reach the University via the M-Line can take either the light rail or dedicated M-Line buses. 28-Line Service: From 8:30 am to 5:30 p.m., MTA will provide supplemental service on the 28-Line bus, which provides service between the Daly City BART Station and SF State.